View looks over a roadway and grassy area. Arch bridge in distance, slightly left of center. The large building in background looks like The Arsenal. 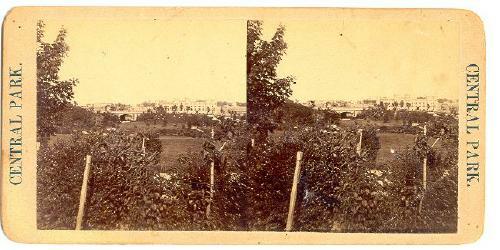 If so, then this view is probably from within Central Park looking east. with rounded corners. Blank Beige verso. Light corner and edge wear. Few specks and mild discoloration of mount on front and on back. Very small scuffs on photos. Apx 1/4" scrape on right photo near bottom edge. Shallow crease (on photo only) about 3/4" from lower right corner of right image.